Junagadh is located at the foot of Jain piligrimage center Girnar Hills. The name when translated to local dialect menas "Old Fort". 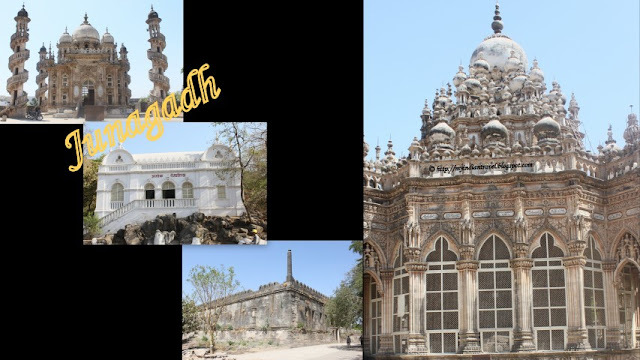 Another ancient name of the city is "Yonagadh" meaning of "City of the Yona" as this place in the ancient times was inhabited by Greeks under the Indo-Greek Kingdom. We visited this place during our journey from Rajkot to Somnath. We had a car breakdown and lost around 6 hours. The car was finally ready at 9 p.m and we proceeded to Somnath. Interesting to see the architectural features, especially stairways winding around the towers. Beautiful places. I see the European influence in the building on the bottom right. What an awesome place, Rajesh! And, beautiful blue skies as well!! Thanks for sharing!! Have a great new week! 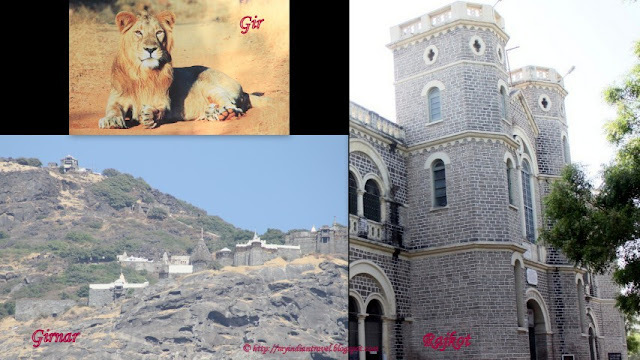 A wonderful area, want to see the Gir national park. The dome is ornately decorated. It would require long time to inspect all the details. Where was the lion? Too bad about the car breakdown. .. We've had that happen a few times when traveling ... Not fun, but we " road warriors" have to expect that sometimes. A beautiful place and very interesting history Rajesh. Interesting. So much details.Very nice photos! So interesting and amazing architecture. Wonderful views, beautiful, I love you've captured, pretty pictures! Wonderful building with lots of historie... nice photogrraphs too. Interesting collection of photos today. Have a nice week. Very impressive buildings - they look as if they've withstood the test of time. I didn't know the Greeks were in India. So much to learn. Wonderful post and creative presentation of photos ~ Lovely history too. At least you 'chose' a beautiful place to break down. What an interesting history. Looks like an interesting city! Great photo. Nice narration. Junagad fort is also a great historical importance. There is a buddhist meditation room three story underground nearly 2000 year old. I love Junagadh.